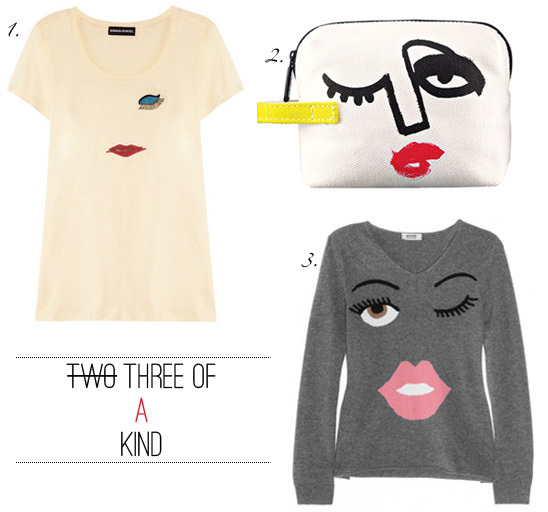 I absolutely love the grey jumper – Moschino cheap hell no!, chic ah yes! And b) I love Sonia Rykiel. P.S. Any luck with the IKEA dresser/your limited edition print? Oooo, you’re absolutely right on that one Erin, how could you possibly choose between the three? I’ll have the lot thank you! Wink wink. I love the grey crew kneck sweater. However, the tshirt is much more understated and versatile. Oh, how fun! I like this interactive game. I’m going with the tee because it’s a bit more subtle, and for the reasons Chi states above (piggy backing, I am). Hope you’re having a great day! What are the odds? You called it by going with both tops. the tee! and i wish i could tell you why, but it’s just what my instinct tells me when i see them paired together. all of these items are adorable though.